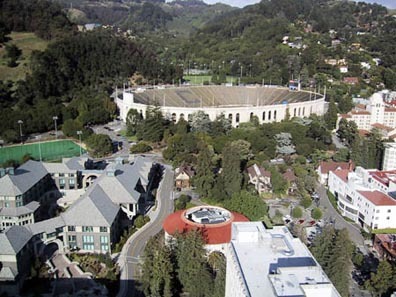 Berkeley Landmarks :: Whither California Memorial Stadium? in a sylvan setting with no parking. 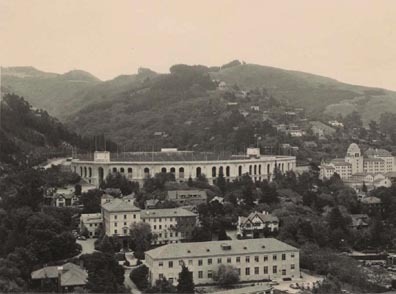 The California Memorial Stadium (John Galen Howard, 1921) is a 72,662-seat giant perched on the mouth of Strawberry Canyon, at the base of the Berkeley hills. Built in thankful memory of those Californians who in the War of Nations gave their all that we might live, it was completed just in time for the 1923 Big Game. The dimensions of this grand Beaux-Arts structure were said by U.C. president David Barrows to slightly exceed the great Coliseum of Rome. Although it is elevated on the eastern edge of the sloping campus, the stadium today is barely visible from most vantage points owing to tree growth over the the intervening years, as well as newer buildings that now obscure the dramatic eastward vista. 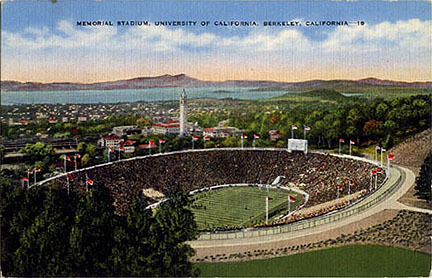 Strawberry Canyon was not John Galen Howards first choice as a site for Memorial Stadium, partly because the site required massive excavation. 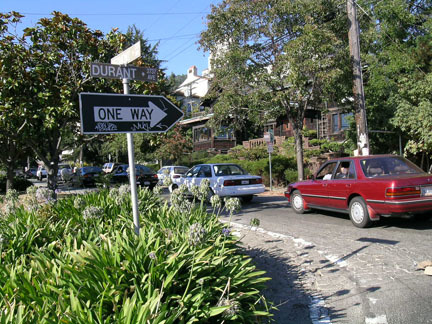 Howards preference was a site near downtown Berkeley (now Edwards Field). But pressure from trustees, and the fact that a portion of the Strawberry Canyon site was already owned by the University, forced the issue. Despite the significant drawbacks attached to the Strawberry Canyon locationincluding the presence of the Hayward Fault directly under the siteand in the face of significant protest at the time, including an open letter signed by William G. Corlett, Henry H. Gutterson, Bruce Porter, Walter H. Ratcliff, Jr., and Walter T. Steilberg, the mechanical problems were thought to be solvable through engineering solutions such as culverting the creek, dynamiting Charter Hill for landfill, and placing expansion joints between the concrete sections. Being largely out of sight, the stadium is also out of mindexcept on Game Days, when traffic becomes unmanageable and parking places are at a premium. It was not built as close to public transportation as was originally desired. The 1920s subscription brochure boasted that 1200 machines would be able to park within a half-mile radius of the Stadium, recognizing even then that many if not most most would drive to the games rather than travel by streetcar. Today, the common expectation continues to be that the stadium is to be reached by way of two-lane, mostly residential streets. Very little parking is available around the stadium because it was built without parking lots, and the few that exist were added after the fact. However, game goers do seem to find parking on city streets for these special eventssometimes as far as two miles awayand the walk to the stadium has become part of the annual Game Day tradition. Walking through Berkeleys residential neighborhoods is enjoyable, and Game Day even offers the opportunity to show off our town to visitors! The parking problems have never been solved, partly because automobile access to the stadium is limited by the geography. There is limited egress east through the hills, while leaving the Stadium en masse from other directions is restricted by the narrow residential streets of the historic neighborhoods separating the stadium from downtown Berkeley and major arterial streets. Those who might complain that Memorial Stadium stands at a disadvantage to other Pac-10 stadiums such as Stanford Stadium and Los Angeles Memorial Coliseum (which, we understand, are served by 10,000 and 8,200 on-site parking spaces, respectively), are ignoring the added attractions that give Berkeleys Game Days a sense of tradition and gaiety. Where but in Berkeley can one follow the Cal Marching Band on Piedmont Way or feel the camaraderie of small groups ambling along Berkeleys leafy streets after a game? The paucity of close-by parking lots has proved to be advantageous to the academic setting of the campus, by making impossible more intense commercial use of the stadium over the years. Now that the stadium is due for a seismic retrofit, many fear that pressures exerted by the sports entertainment industry might cause the university to lose sight of its mission, traditions, and fast-disappearing bucolic setting. Might the stadium then lose its architectural dignity? Be expanded? Grow taller? Might it be used for night games, concerts, or other commercial uses? Any one of these would be devastating to surrounding neighborhoods, which are already heavily impacted by stadium-generated traffic, noise, and trash. The activity attending the half-dozen or so annual Game Days lends a festive atmosphere to the town; anything more would strain to the limit the delicate balance between town and gown. Copyright © 20052007 BAHA. All rights reserved.